suitably fast paced, and there were elements of survival horror to keep me gripped on the edge of my seat. Scenes to look out for include one near the beginning of the movie involving buddy breathing, another in the middleinvolving the rather gruesome death of a female character, and one near the end which sees Josh help his father out. The general consensus is that the characters in this movie aren't particularly likeable, and I agree. Gruffud and Parkinson in particular portray a rather annoying couple, and Gruffud's character Carl morphs into somewhat of a villain by the end of the movie. Richard Roxburgh actually does quite a good job as gruff, misunderstood father Frank. He takes a lot of stick for being unfeeling throughout the movie, but I for one thought that it was unwarranted, as he was trying the best that he could to help everyone escape. The film attempts some father-son bonding between Frank and Josh near the end of the film, but this aspect feels rushed and forced. The underwater caves themselves are beautifully lit and shot. We went to see the 3D version of the film - this was particularly effective at the start of the movie, where the team are flying through a jungle to the cave. My friend and I actually started to feel a bit motion sick during this part, although that could have been due to the visit to the pub beforehand! 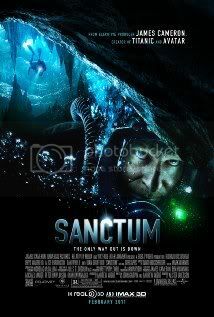 Overall, whilst Sanctum is no Titanic or Avatar, it is a very entertaining if slightly predictable thriller. There were some scenes where I actually felt some of the panic that the characters must have felt, so it must have been doing something right. Hey guys, hope you enjoyed my second review If you've been to see Sanctum, what were your thoughts on it?